A consistent personal devotion is the path to spiritual strength. 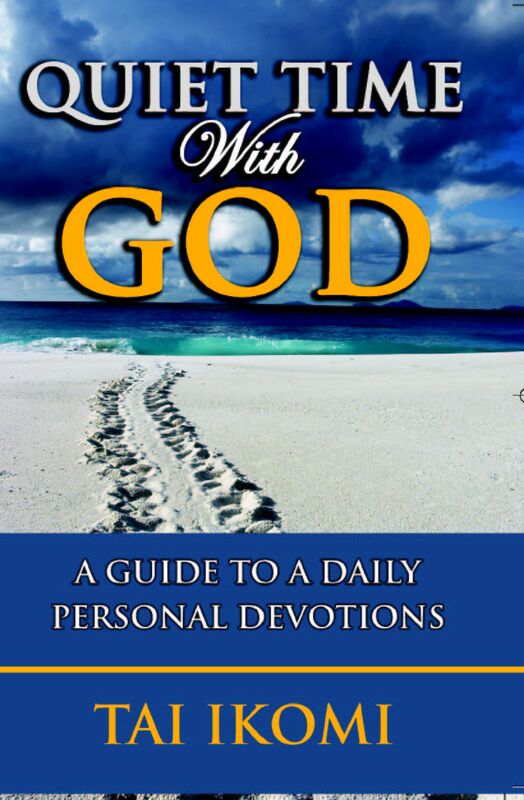 This book discusses practical hints about how to develop and maintain a healthy and practical time with God. It will help you avoid the dangers of not spending the Quiet Time you are called to have with your Father in heaven. At times, in order to better define a word, it is best to know what it is not. Quiet Time is not a resting time when you listen to a nice Christian song or sermon in the comfort of your room. It is not merely reading the Bible nor even preparing a Sunday School lesson. Quiet Time does not take place during the silent prayer session in a church service or a night vigil. Quiet Time cannot be shared with anyone. It is not the regular family devotions. It is not the time during which you pray with someone. It is not a time when you watch a wonderful and anointed speaker or teacher on TV. All these exercises are wonderful, and some of them may indeed be parts of a Quiet Time, but they do not constitute the whole Quiet Time. Quiet Time is a regular time set aside each day exclusively to meet God personally through praise, prayer and Bible reading. It is a time for you to be with God by yourself. During this time, no other activity is engaged in. The time is for you to spend with God, and Him alone. The Object of your Quiet Time is God — God the Father, God the Son, God the Holy Spirit. God is your focus. He is the One you are seeking to know, to love, to worship. As you come into His presence, your desire is to meet Him and to experience Him. Therefore, you must concentrate and direct your gaze on Him. Nothing must compare with Him. Your aspiration is to reach God and God alone. Your ears are open to hear His voice. Your heart is inclined to obey Him. Your spiritual eyes are tuned to behold the King in His splendor and beauty. In essence, God is the One and only Object of your Quiet Time. Quiet Time with God is a must in the life of a believer. It should be done daily to enjoy its full benefit. The Bible offers many rewards for Quiet Time. Happy is the Christian who is taught at the moment of conversion to have a consistent Quiet Time. It is the pathway to a robust Christian life. He will be strong when other Christians are weak. He will be more joyful than the Christian who does not have his Quiet Time. He will grow healthy in his spiritual life. God desires that you fellowship with Him. He wants you to enjoy His company, and He also wants to enjoy yours. You see, unless your fellowship is strong and healthy, you cannot fully realize your potential or the reason for your existence.